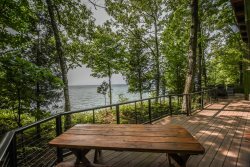 This idyllic lakefront house situated on Little Platte Lake just six miles south of Empire offers nature lovers, art lovers, kayakers and canoeists unparalleled peace and quiet to enjoy the nearby National Lakeshore which is within walking and canoeing distance! Enjoy swimming and wading in Little Platte Lake with many of the comforts of home at hand! This comfortable and charming house situated on a little over a half acre of land offers a wonderful base to explore the National Lakeshore, Benzie County’s cultural amenities including restaurants, museums and art galleries, wineries, and the surrounding countryside. With easy access to the National Lakeshore headquarters in historic Empire and the pristine town of Frankfort also not far away, there are simply not many places nicer. We invite you to stay at our private paradise and think you will agree that the area is one of the prettiest in the Sleeping Bear Dunes National Lakeshore.